CGL Insurance Pennsylvania CGL (commercial general liability) insurance will protect your small business from financial losses. These can range from property damage, lawsuits, advertising injury, or any other liabilities your company might have which relates to personal loss for a client or employee. Non-professional negligent acts are covered under your CGL policy, so as a business owner you should understand what it covers, and how a CGL insurance Pennsylvania policy can protect your business. CGL insurance Pennsylvania protects your business from lawsuits with rates as low as $27/mo. Get a fast quote and your certificate of insurance now. Do I Need CGL Insurance For My Business? 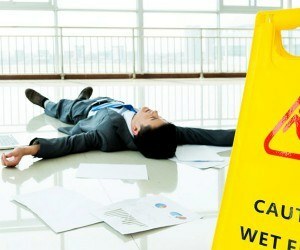 Slip and fall cases or a custom tripping and falling on damaged flooring within your commercial space. An employee which leaves water running and causes damage to a client's home. Misleading advertising, or class action lawsuit against your business. These are a few of the many instances you can be found liable as a PA business owner. 1. Coverage A - Bodily Injury and Property Damage: The property damage or bodily injury which stems from non-professional negligent acts, are covered under this section of your CGL insurance Pennsylvania policy. Mental injuries or distress claims might also fall under this category, even when physical injuries aren't present. PA worker's comp and employment practice liability are excluded under this clause. You can however purchase additional coverage for these protections. Pollution liability is also excluded. Any high risk business entity should consider purchasing this limited coverage to protect themselves financially. Liquor, professional, and other liability risks might also be excluded (check with your insurer). An broker can assist you in choosing coverage options. Entry/evasion of property or wrongful eviction claims. 3. Coverage C - Medical Payments: Personal injuries sustained by non-employees are covered with this coverage option. If an accident occurs in the business place, your company is protected to your coverage's extent. Even in the event of settlements you are covered, so this can limit litigation and attorney fees for your business. You are covered for all necessary medical, ambulance, or surgical/medical care necessary for the injured party. No defense or legal liability coverage is afforded under this section of the CGL insurance Pennsylvania policy(as is the case with coverage A and B). CGL insurance Pennsylvania can be purchased on its own or with a BOP policy or CPP (commercial package policy) insurance. It is best to discuss your options with an insurance agent prior to deciding. And, in the event CGL, BOP, and CPP aren't sufficient, umbrella (excess liability) policies are also available for businesses to consider. 1. Director/Officer Liability - Past, present, and future directors and officers are protected with this coverage option. Wrongful acts committed by these persons in a profit or not-for profit business are protected. Whether it is an actual or alleged error, your coverage shields your business from liability. Misstatements, omissions, errors, or breach of duty, are all covered under policy coverage. 2. Liquor Liability - Covers your business from loss or damages which are claimed in the event your patron/client is intoxicated, and either injure themselves or another person. If your company sells or furnishes liquor, this is a policy coverage option you should invest in. You can purchase as an add-on or stand alone policy, but if not added, your general liability protection won't cover these damages. 3. Pollution Liability - Industrial, agricultural, and commercial property owners, managers, or developers, are protected with this form of coverage. Gradual as well as accidental pollution claims are protected, and assets from unforeseen environmental exposure which could affect earnings, are also protected. Pollution hazards which can lead to bodily injury or harm, are also covered under this optional coverage prong, as are clean up costs. There are additional types of insurance that may be a good fit for your business. Your agent can then help you find the right coverage to protect you against those specific risks. Request a free CGL Insurance Pennsylvania quote in Aliquippa, Allentown, Altoona, Ambridge, Baldwin, Beaver Falls, Bellevue, Berwick, Bethel Park, Bethlehem, Bloomsburg town, Bradford, Brentwood, Bristol, Brookhaven, Butler, Camp Hill, Canonsburg, Carbondale, Carlisle, Carnegie, Castle Shannon, Chambersburg, Chester, Coatesville, Collingdale, Columbia, Connellsville, Conshohocken, Darby, Dormont, Downingtown, Doylestown, DuBois, Dunmore, East Stroudsburg, Easton, Economy, Elizabethtown, Ellwood, Emmaus, Ephrata, Erie, Franklin Park, Gettysburg, Glenolden, Greensburg, Grove, Hanover, Harrisburg, Hatboro, Hazleton, Hermitage, Huntingdon, Indiana, Jeannette, Jefferson Hills, Johnstown, Kingston, Lancaster, Lansdale, Lansdowne, Latrobe, Lebanon, Lewistown, Lititz, Lock Haven, Lower Burrell, McKeesport, Meadville, Mechanicsburg, Middletown, Millersville, Milton, Monessen, Monroeville, Morrisville, Mount Joy, Munhall, Murrysville, Nanticoke, New Castle, New Cumberland, New Kensington, Norristown, Northampton, Oil, Old Forge, Palmyra, Perkasie, Philadelphia, Phoenixville, Pittsburgh, Pittston, Pleasant Hills, Plum, Pottstown, Pottsville, Quakertown, Reading, Ridley Park, Scranton, Shamokin, Sharon, St. Marys, State College, Sunbury, Swissvale, Tamaqua, Uniontown, Warren, Washington, Waynesboro, West Chester, West Mifflin, White Oak, Whitehall, Wilkes-Barre, Wilkinsburg, Williamsport, Wilson, Wyomissing, Yeadon, York and all other cities in PA - The Keystone State.